By combining Seagate’s innovations in product security with IBM’s blockchain expertise, we want to prove that we can help reduce the incidence of product counterfeiting in the future,” said Mark Re, senior vice president and chief technology officer at Seagate. According to the International Anti-Counterfeiting Coalition, global trade in counterfeit and pirated electronic products has reached more than $1.7 trillion in value. To verify product authenticity, Seagate will update the IBM Blockchain Platform on the IBM Cloud with product authentication data based on the Seagate SecureTM Electronic ID (eID) at the point of manufacture. Each unique identifier (serving as an electronic fingerprint) can be used to verify the identity of a hard drive at any time during its product life cycle. Seagate’s Certified Erase employs cryptographic erasure technology to produce a digital certificate of data purge, which is electronically signed by the device under the Seagate Secure public key infrastructure (PKI) and stored on the blockchain for compliance management with emerging global data privacy laws. IBM is recognized as the leading enterprise blockchain provider. The company’s research, technical and business experts have broken barriers in transaction processing speeds, developed the most advanced cryptography to secure transactions, and are contributing millions of lines of open source code to advance blockchain for businesses. IBM is the leader in open-source blockchain solutions built for the enterprise. Since 2016, IBM has worked with hundreds of clients across financial services, supply chain, government, retail, digital rights management and healthcare to implement blockchain applications, and operates a number of networks running live and in production. The cloud-based IBM Blockchain Platform delivers the end-to-end capabilities that clients need to quickly activate and successfully develop, operate, govern and secure their own business networks. IBM is an early member of Hyperledger, an open source collaborative effort created to advance cross-industry blockchain technologies. For more information about IBM Blockchain, visit https://www.ibm.com/blockchain/ or follow us on Twitter at @ibmblockchain. ©2018 Seagate Technology LLC. All rights reserved. 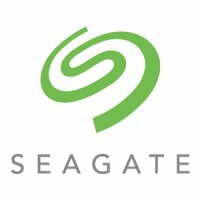 Seagate, Seagate Technology and the Spiral logo are registered trademarks of Seagate Technology LLC in the United States and/or other countries. Seagate Secure is either a trademark or registered trademark of Seagate Technology LLC or one of its affiliated companies in the United States and/or other countries. All other trademarks or registered trademarks are the property of their respective owners. Seagate reserves the right to change, without notice, product offerings or specifications.